I have no idea where the month of December went but it certainly flew by for me! I meant to post this recipe last Monday, but with all the last minute Christmas shopping and wrapping, the day escaped me. 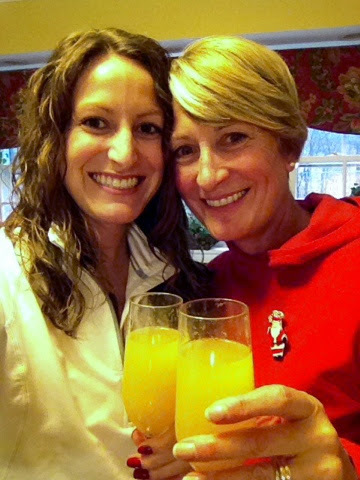 I hope everyone had a great Christmas with family and friends! I crossed my fingers for a white Christmas but sadly, it was 50 degrees and sunny...hopefully a mild winter this year?! 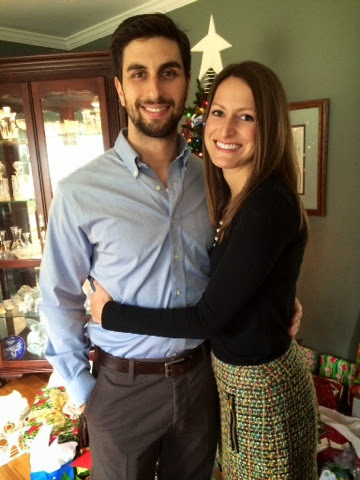 Christmas with my Fiancé! Next Christmas I'll be married...weird to think about!! Last weekend Sean went to the Hawks game with a friend and I had the night to myself. I actually love when those nights occur because I can make and watch whatever I want! 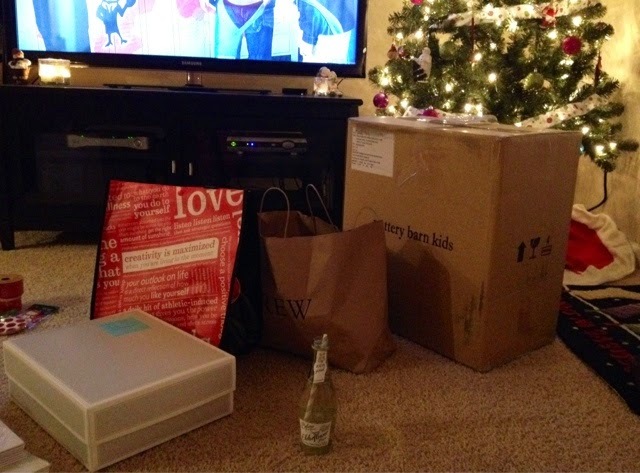 I watched The Holiday, one of my favorite Christmas movies and finished up wrapping gifts. It was such a glorious night! For dinner I cooked something I knew would never fly with my loved one. Has anyone else been into truffles? Not the real stuff, of course, those are incredibly expensive and hard to find! 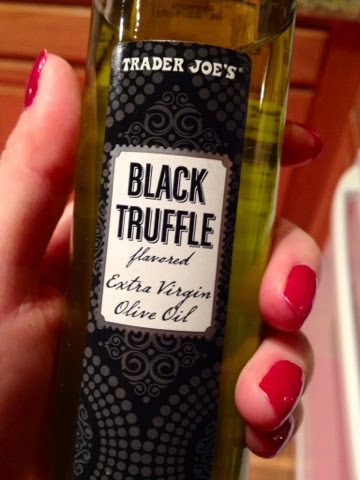 I was recently at Trader Joe's and found black truffle oil and goat cheese with truffles...both under $5. Score!! 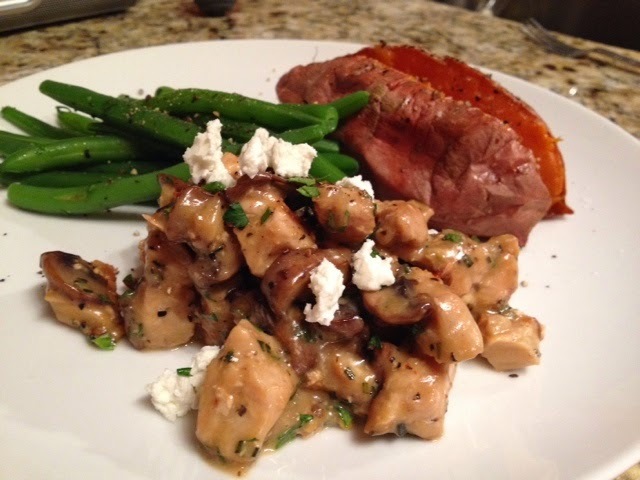 I diced and cooked a chicken breast and made a delicious mushroom goat cheese sauce and finished it with some fresh herbs and truffle oil. Holy moly. Dice and brown a chicken breast. I seasoned lightly with salt and pepper. 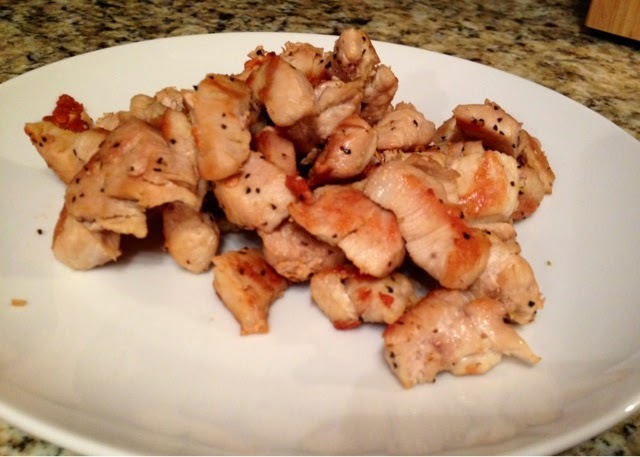 Remove the chicken and hold it on a plate or bowl. 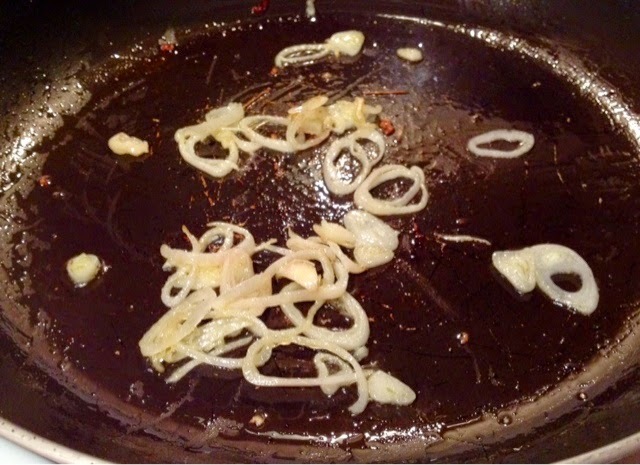 Add in thinly sliced shallots or onions and saute on medium for about 2 minutes. 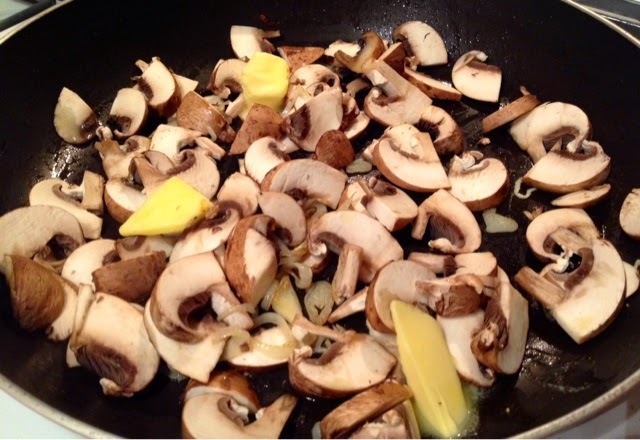 To these add sliced mushrooms. 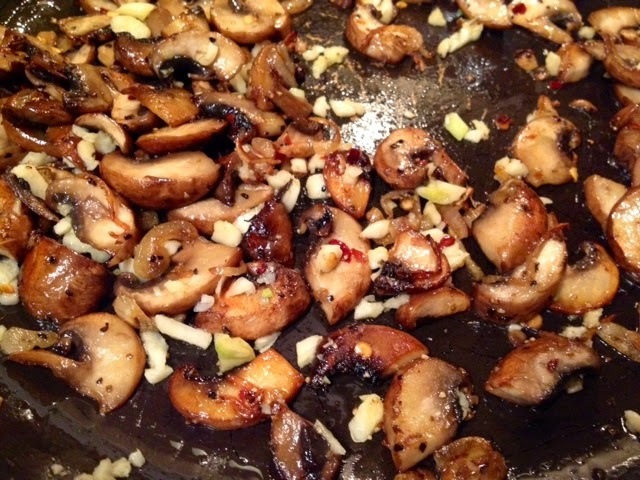 I used baby portabellas but go nuts and use whatever you like! Add in a few hunks of butter...because it's the right thing to do. 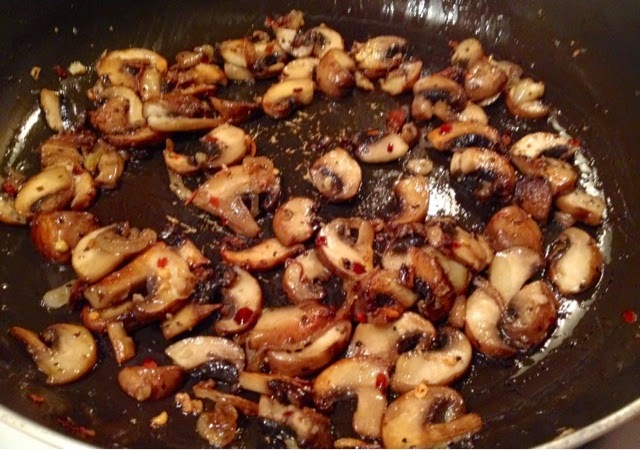 Once the mushrooms are slightly golden season them with salt and pepper. I added some fresh rosemary and thyme, minced garlic, and a dash of red pepper flakes. Pour in 1/4 cup chicken broth and scrape up all the bits at the bottom of the pan. 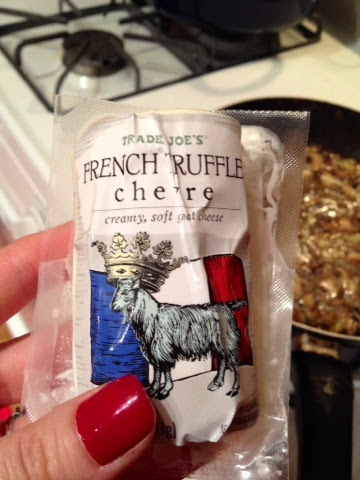 Now, crumble in the whole log of goat cheese with truffles...it's only 4 ounces...and what the heck, it's the holidays! Reserve about a Tbl for a garnish. 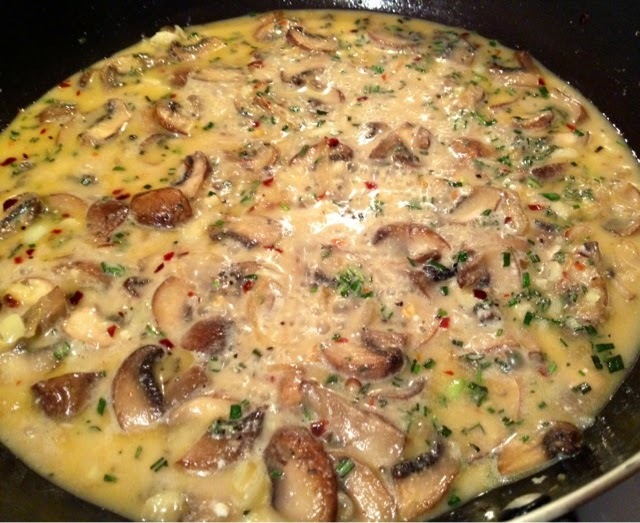 Add the chicken back in with the goat cheese sauce and finish with a splash of truffle oil. This stuff is potent so a little goes a long way! I wanted to serve this over pasta but it's all about balance here so I served it with green beans and a baked sweet potato...with butter. Hope you try this one out! Today is Tuesday...totally throwing me off since I took Friday and Monday off of work. Feels like Monday although I wish it were already Friday :) I had such a productive yet festive weekend. I spent Monday with my mom baking Christmas cookies and went on a fun "field trip" to Hobby Lobby. Gotta love a 50% off Christmas sale! I did most of my shopping, although most stores were such a nightmare that I ended up finishing up online. Best of all, I got to watch several classic Christmas movies along with a few randoms and relaxed with my guy around our house...err apartment. Oh, did I forget to mention, we picked a date!! A few weekends ago we signed at a local venue for August 21st, 2015! We also picked our honeymoon destination...hello St. Kitts!! Big decisions done, now for the smaller yet still important details. I only have 5 more days of work until I get to enjoy 8 business days off!! Relaxation is so nice, isn't it? Even though my mom will kill me I wanted to share a few pictures of our great day together! "I'm only taking home a few because I will eat all of them". Thank goodness because I've already eaten several. Loving my new tin from Hobby Lobby. Hope you all are enjoying the holidays! 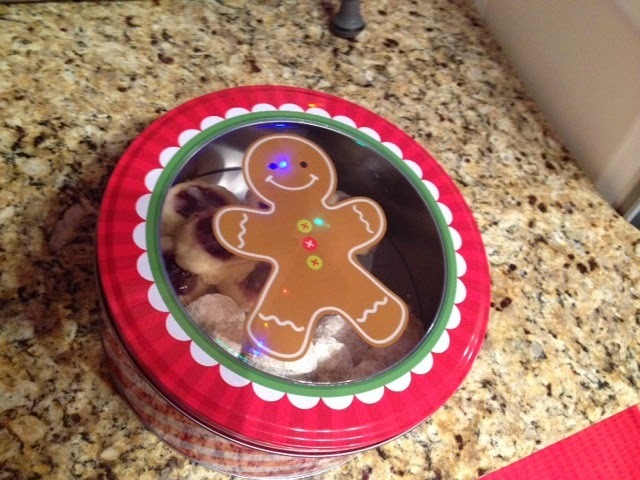 Bake cookies or make something that intimidates you...one of my New Years resolutions that I'm starting a little early! 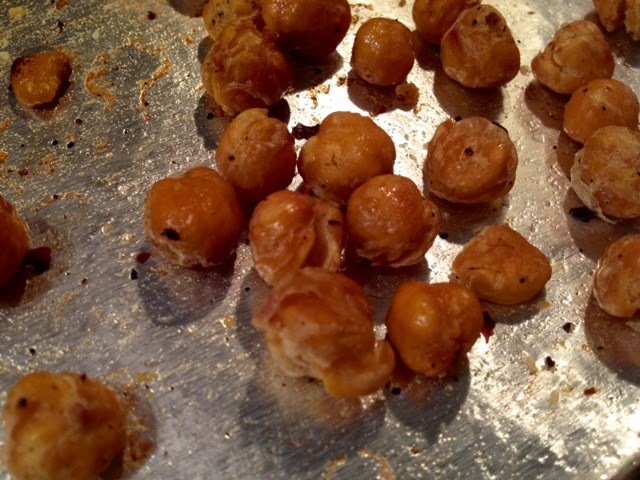 I've been pretty hooked on this snack lately and wanted to share this ridiculously easy recipe with you! 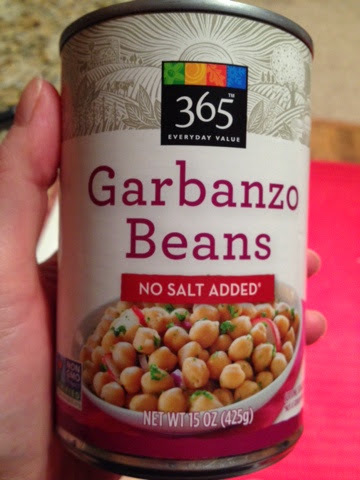 Start with a can of chickpeas (garbanzo beans). 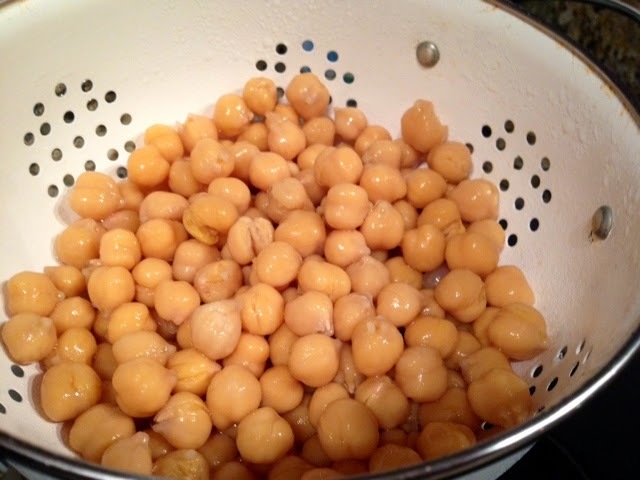 Rinse the beans really well in a colander and shake the excess water out. 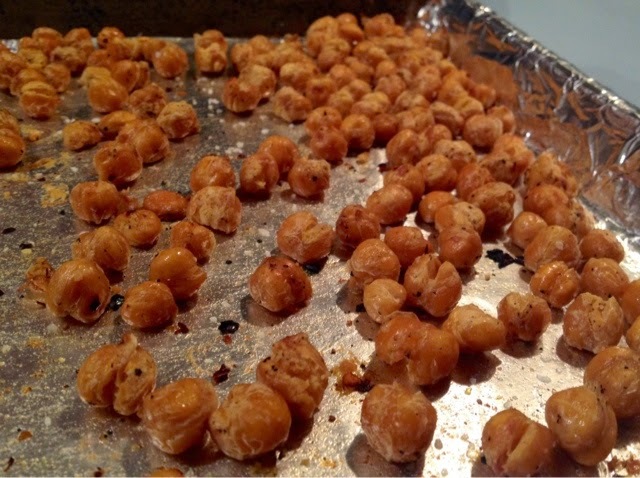 Pour them onto a foil lined baking sheet and pat dry with paper towels. 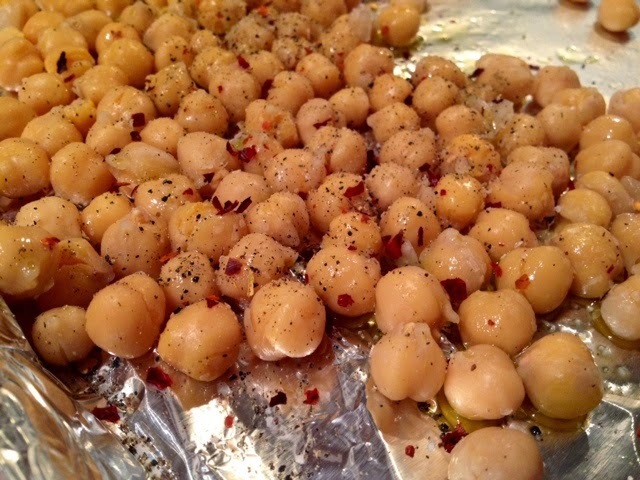 Drizzle on a little bit of olive oil, salt, pepper, and red pepper flakes and bake in a 375 degree oven for 45-55 minutes until they are crispy. The center will be slightly soft but the outer shell is pure salty crispness that's just outstanding. I love to eat these as a snack when they are piping hot out of the oven (or fryer) but storing in an airtight container will keep it pretty crisp for a day or two. 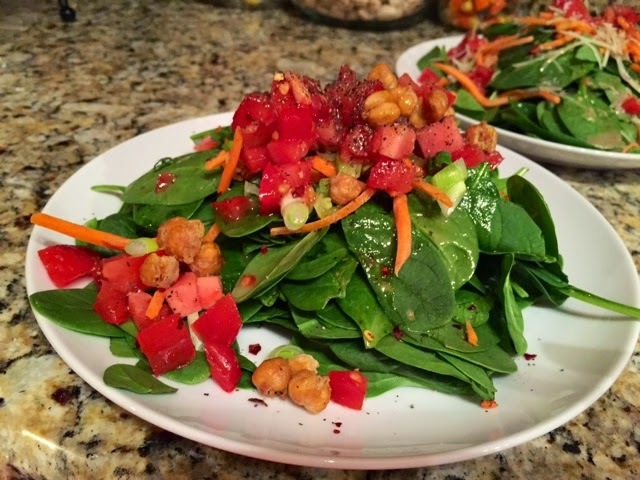 They tend to lose that crunch factor as leftovers so I'll toss them in a salad as a "crouton" and it's delicious! It's a healthy simple treat! After a great family-filled weekend I can honestly say I consumed my limits in food and wine. Not that it's a bad thing, I enjoyed every bit of it, but it's time to get back to my normal routine! We haven't eaten a meal at home in maybe 5 days so I really wanted to make something special for our Sunday night dinner and lamb it was. Lamb is one of Sean's favorite things so I knew I'd score some big points with him! 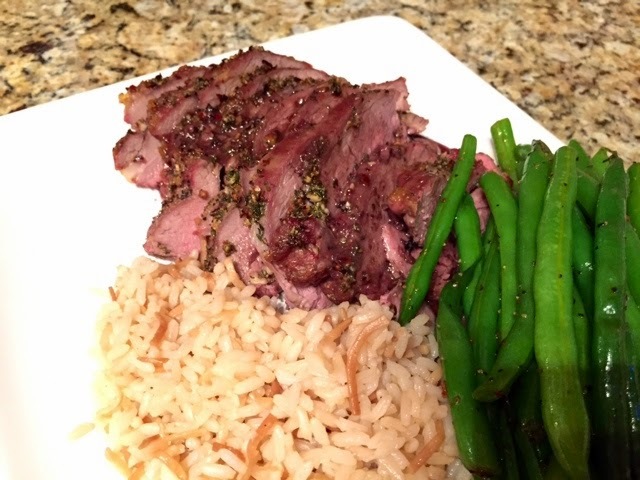 I made a really easy lamb roast that I cooked over potatoes and served it with green beans and leftover rice pilaf. A little carb heavy but whatever, it's the holidays. Today as I'm writing this I'm enjoying the leftovers in the comfort of my home and enjoying a day of leisure as I took the day off. After a busy weekend I really needed that extra day to sleep in and be productive...or unproductive...it was a combination of the two! It felt great to stay in my pj's and get things done around the house! I even set up my Christmas tree...and it's so glorious! I successfully waited until after Thanksgiving this year to begin the Christmas festivities including Christmas music which doesn't sound like a big deal, but for me, it is! Ah, relaxation is always so short lived! 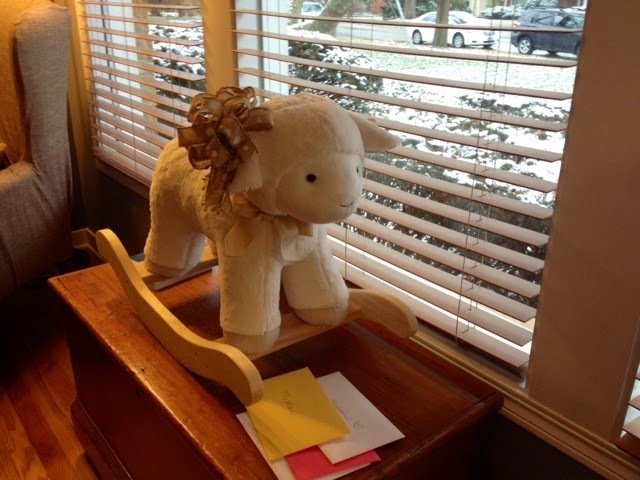 Take the lamb out and bring it to room temperature for about an hour prior to cooking. Be sure to trim the fat cap off, there was about 3/4 inch of fat that I discarded. Mince and combine 2 tbl each of fresh rosemary, thyme, and garlic. 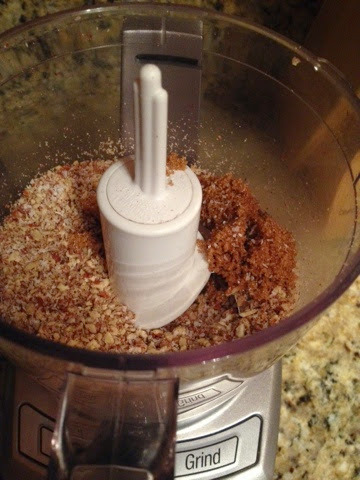 Add about 1 tbl of kosher salt, 1/2 tbl black pepper, and a tsp of red pepper flakes. I also drizzled in a tsp of olive oil to form a paste with the herbs and spices. Rub this paste all over the lamb and give it a good massage! 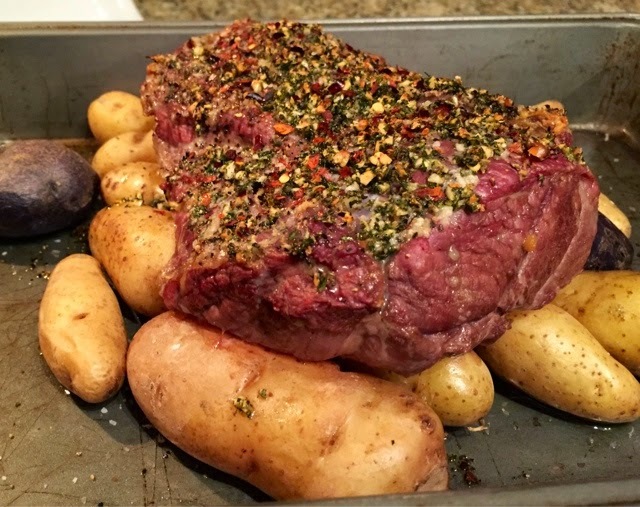 Preheat the oven to 450 degrees and arrange the lamb over fingerling potatoes, or any other potato of your choice. 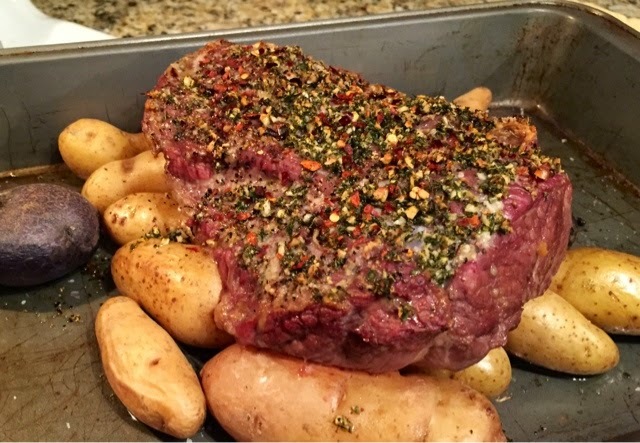 Roast for about 35-40 minutes or until the internal temperature is 145 for medium rare. When the meat is done let it rest on the cutting board covered in foil, for about 15 minutes. 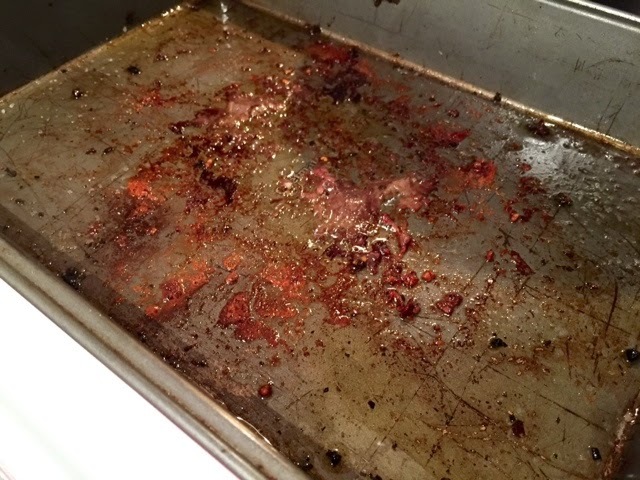 While that happens I like to remove the potatoes from the roasting pan and make a quick "gravy" from the drippings. 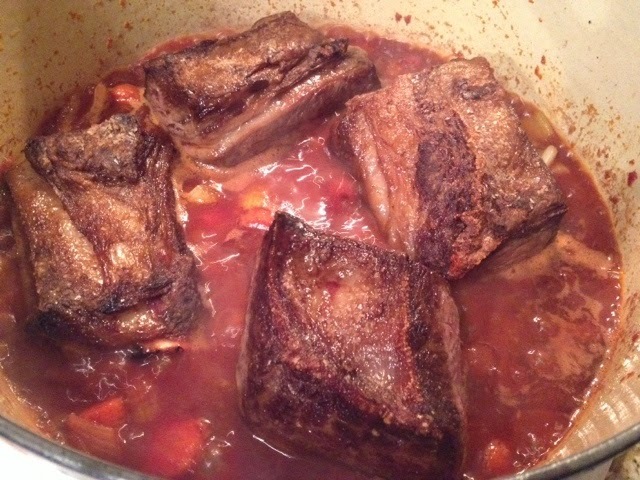 I place the roasting pan right over the burner and hit it with a little red wine and beef stock. Season with salt and pepper and reduce until half, scraping up the bits. 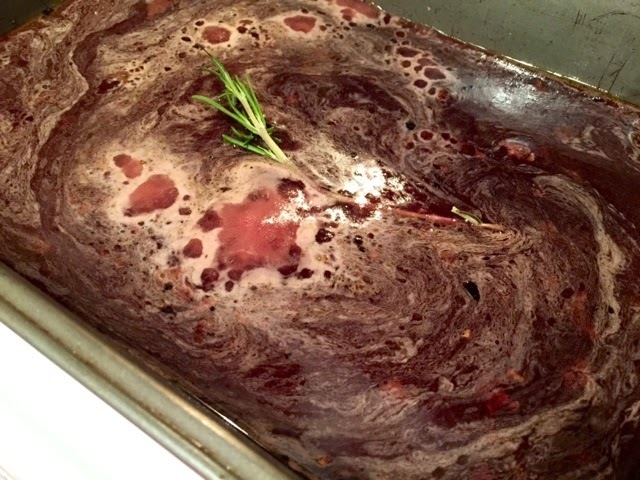 You can also add a small sprig of rosemary and a smashed garlic clove for additional flavor if necessary. Slice the meat thinly and sprinkle the slices with large salt flakes or kosher salt. I served this all on a platter (I like to wash dishes as I go) to make the end cleaning a quick one! 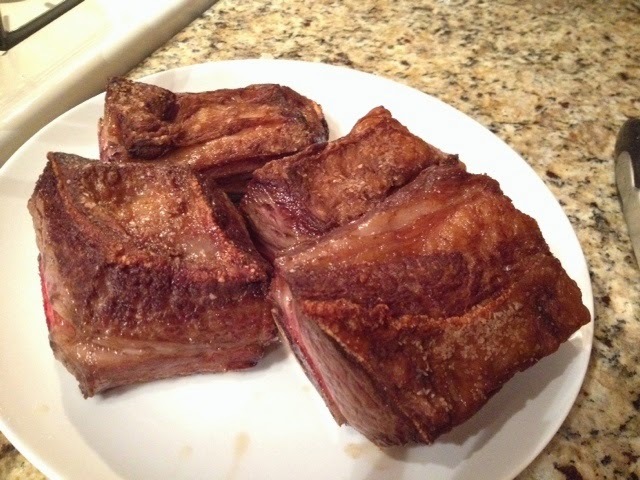 The moment is finally here, I'm sharing my recipe for short ribs! 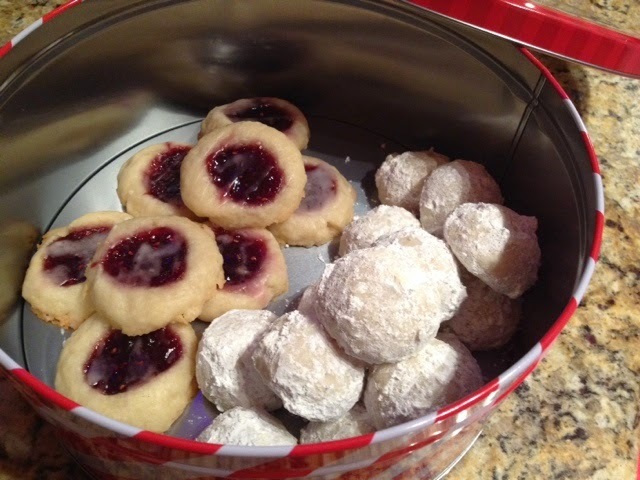 These things are heavenly and once you make them you'll be hooked, I promise. These are slow cooked in red wine, fresh herbs, and garlic. How bad could that be? 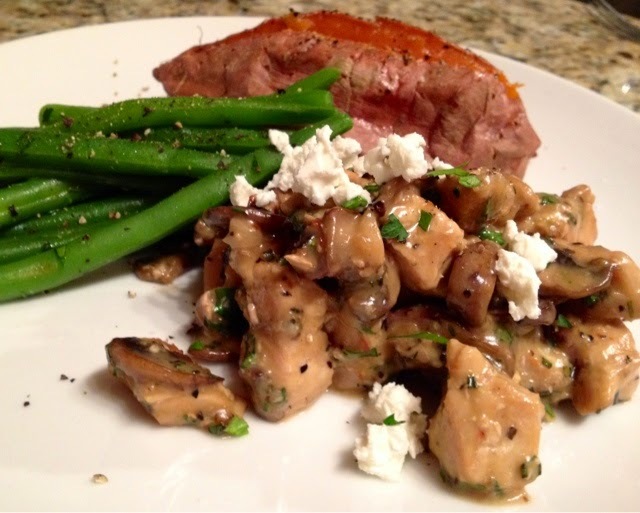 Recipes like this one are my favorite, especially on a lazy Sunday when you can get it started in the afternoon and forget about it for a few hours. The house smells amazing and you don't have to babysit them. For this meal I decided to invite my parents over, because I wanted them to experience this magical short rib dish with us. There's nothing light about this dish, I won't lie to you. Just go for it and serve these over creamy mashed potatoes loaded with cream cheese and butter. Yum. To a very hot dutch oven add equal parts of olive oil and butter. 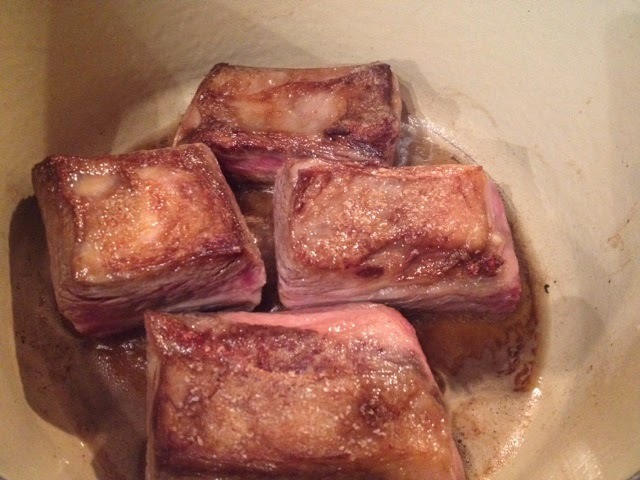 Pat dry the short ribs and season generously with salt and pepper. Sear until golden brown on all sides and then remove to let rest on a plate. 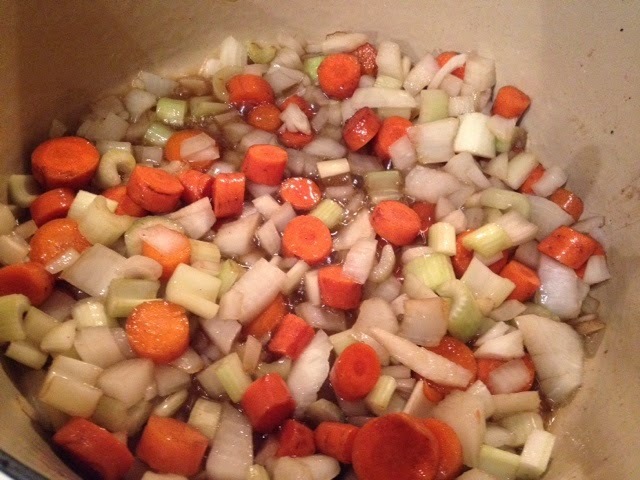 Add in about a cup each of celery, onion, and carrots. Don't worry if the butter is a little browned...it'll add flavor! Saute over medium high heat until lightly caramelized. 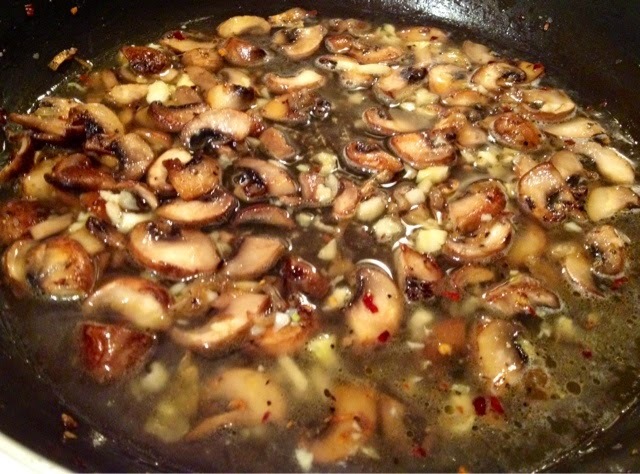 Add in 3 minced garlic cloves and stir until fragrant, about 30 seconds. 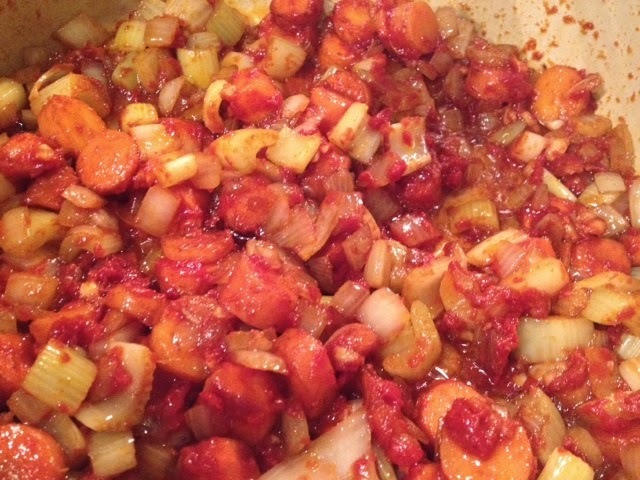 Add in 2-3 tablespoons of tomato paste and stir it around to combine with the veggies. 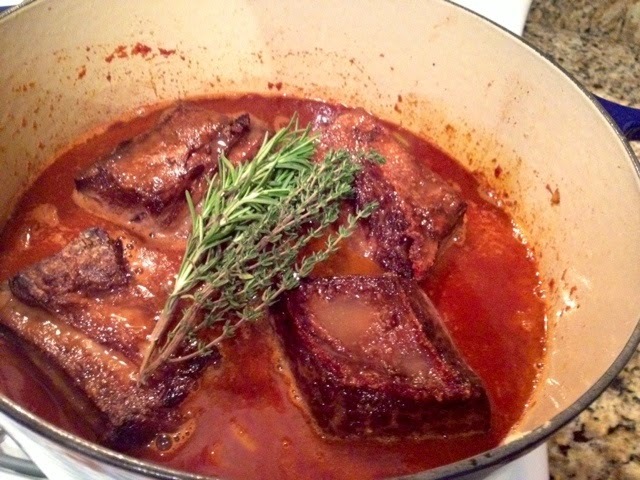 Deglaze the pan, scraping the browned bits of the pan, with red wine and add the short ribs into the wine hot tub. 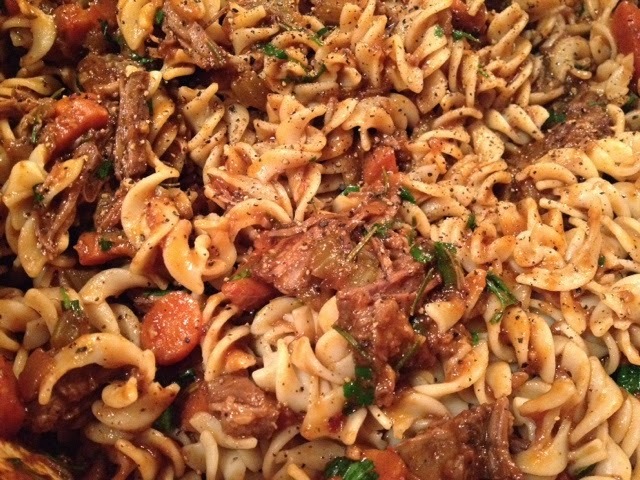 To this add in about 2 cups of beef broth, fresh thyme, rosemary, pepper, and a dash of red pepper flakes. 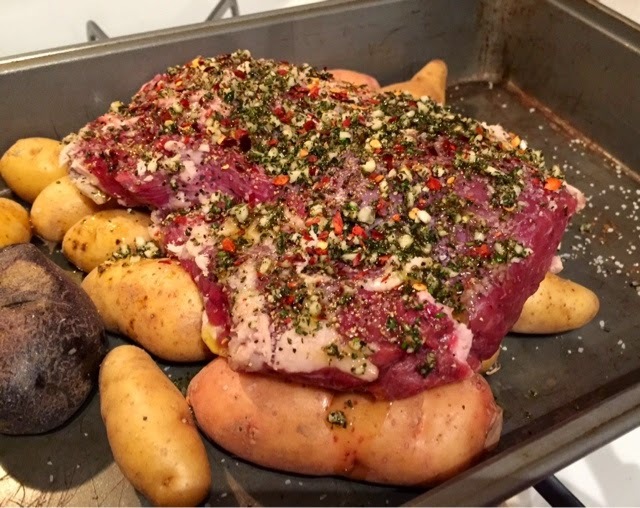 Put the lid on and place in a 400 degree oven for 2 1/2-3 hours or until the meat is fall apart tender. I like to shred or run my knife through the meat and add it back to the sauce. 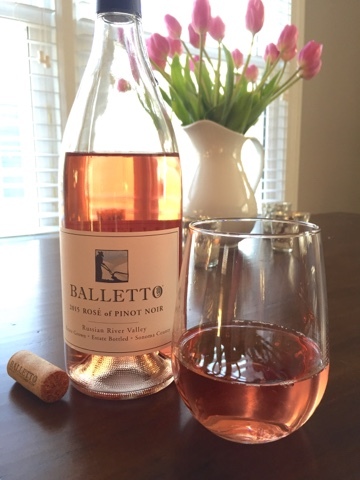 This is delicious served over mashed potatoes or even pasta! 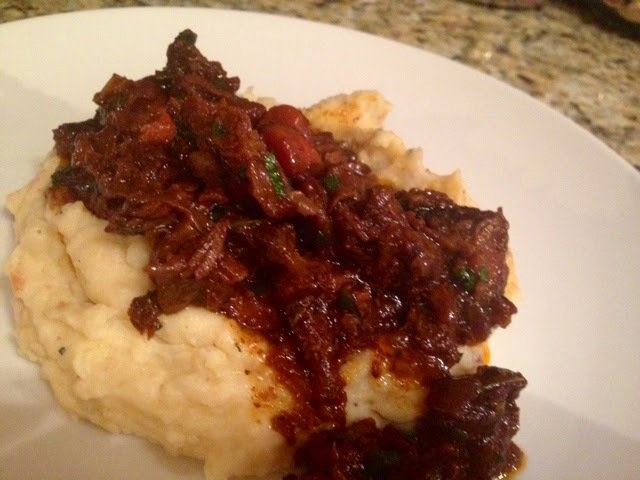 I served this with luscious mashed potatoes made with 2 1/2 pounds of yukon gold potatoes (skin on). 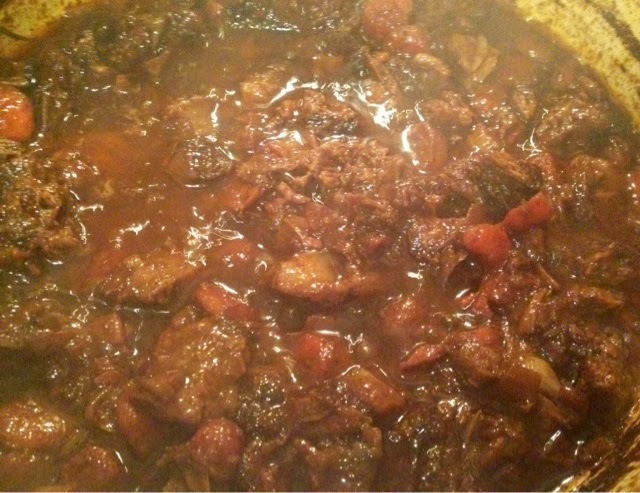 Boil until tender, drain, then transfer back to the pot you cooked them in. With the heat on medium give the potatoes a good mashing for about a minute then add in the good stuff! I used a half block of softened cream cheese, 2 tbl butter, and a few splashes of milk. Season really well with fresh black pepper and salt. I love cooking according to the season and this time of year is at it's finest. I love fall and the holidays that lead into winter. 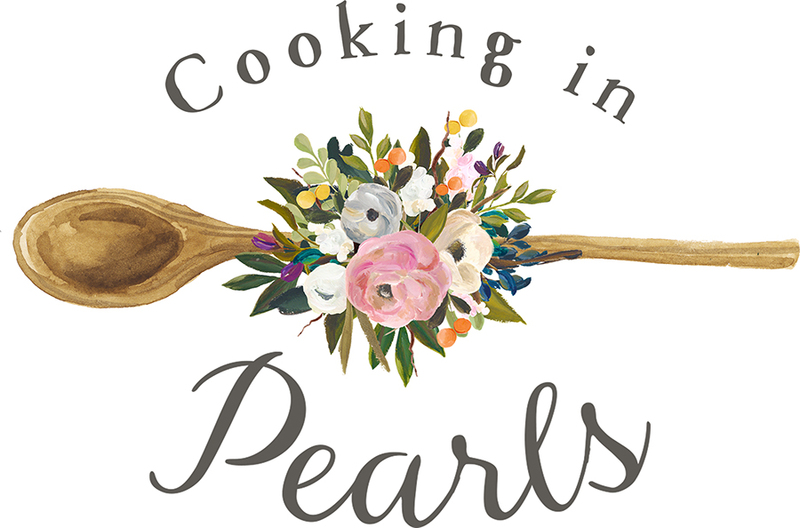 The flavors are comforting and growing up in the midwest, warm comfort food is what we need to survive these blustering temperatures. Sigh...I was not expecting winter to come so soon for us but here we are! To be honest with you, cheesecake is not my first choice in dessert and trust me, my favorite part of any meal is the dessert. It's good but doesn't blow me away. 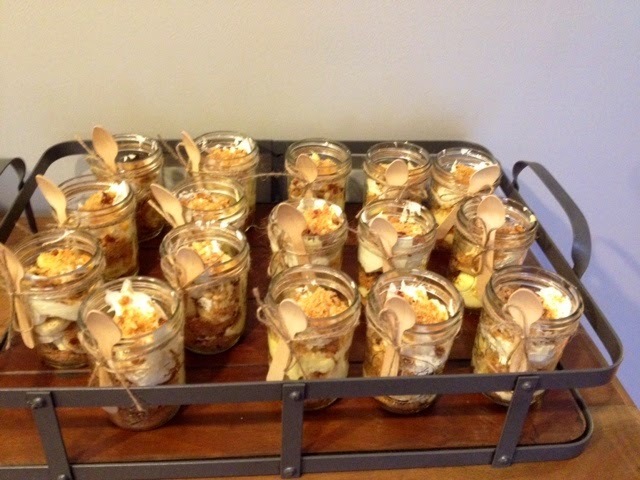 However, I made these cheesecake bites over 2 years ago for my job interview and ever since I have a deeper appreciation for them. I had a normal interview but also had to cook a 3-course meal as an additional portion to the interview. 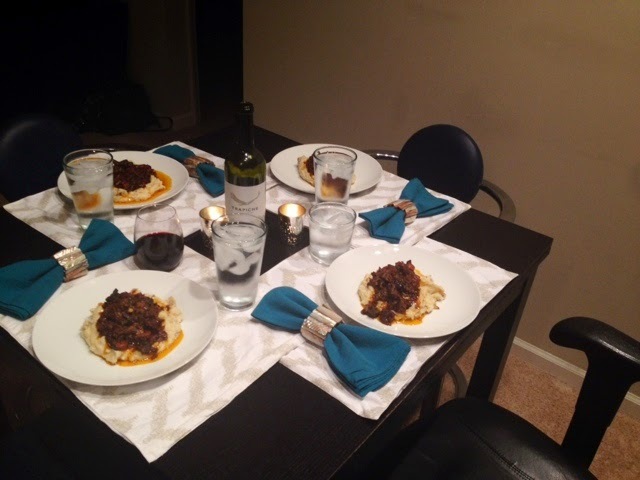 I went with my gut and chose 3 dishes that were seasonal and truly showed my style of cooking. With it being fall I ended the meal with these pumpkin cheesecake bites I found on Pinterest...and practiced prior to the interview, of course. I made a few tweaks but can pretty much thank Life Made Simple for the amazing recipe!! 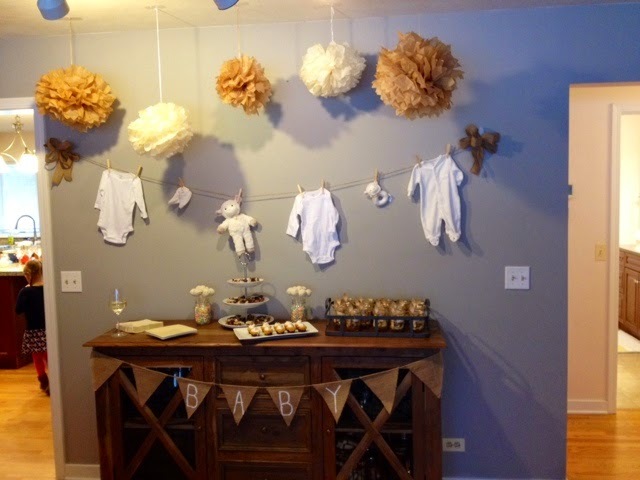 I made these for my sister's baby shower and didn't take every step-by-step photo that I had intended on but I was running late, of course, and had to get these done! 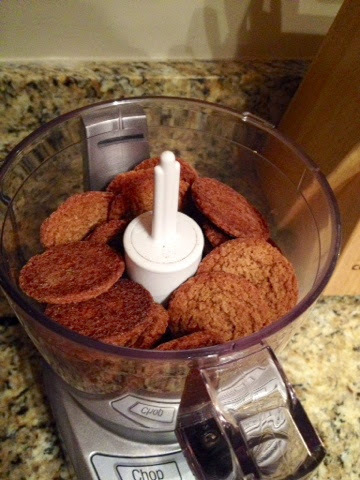 In a food processor, pulse the ginger snaps, brown sugar, pecans, and salt until course. 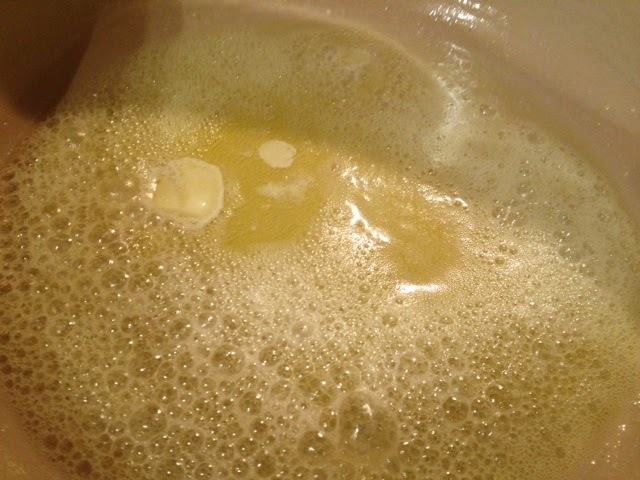 Pour into a small bowl and pour in melted butter, stirring to combine. Spray a mini muffin tin with pan spray and press about a tbl of crumb mixture into each well, pressing slightly up towards the middle. Bake for about 9-10 minutes or unit golden brown. While the crust is baking prepare the cheesecake filling by beating the cream cheese, sugar and pumpkin puree until smooth on medium speed. Add the eggs, heavy cream, vanilla, and spices and continue to mix on medium speed until well combined. Spoon about 2 tbl of the cheesecake over each crust to the brim of each well. Bake in the oven for 20 minutes until set and cool on a wire rack for 20-30 minutes prior to removing. *The middles may sink slightly but don't fret, the whipped cream will cover this imperfection. I found using a spoon and loosening the sides and then lifting up the bottom works great. I placed the cheesecakes right on a platter and stashed them in the fridge until I was ready to serve them. Just before serving I piped whipped cream on each one and dusted nutmeg (or pumpkin pie spice) on top. 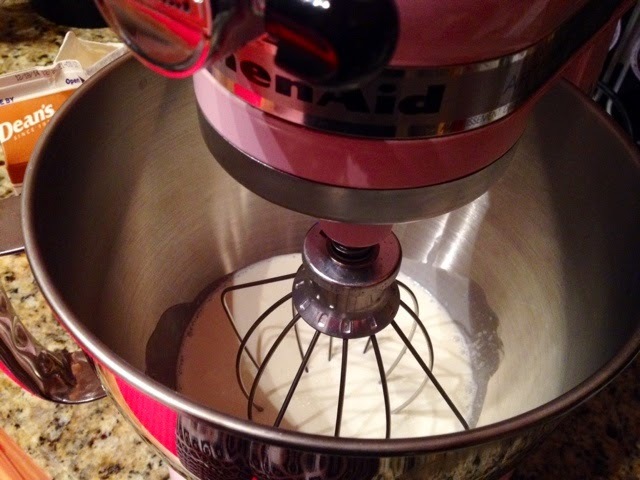 To make whipped cream I used my wire whisk attachment and beat the heavy cream on medium until medium peaks formed. 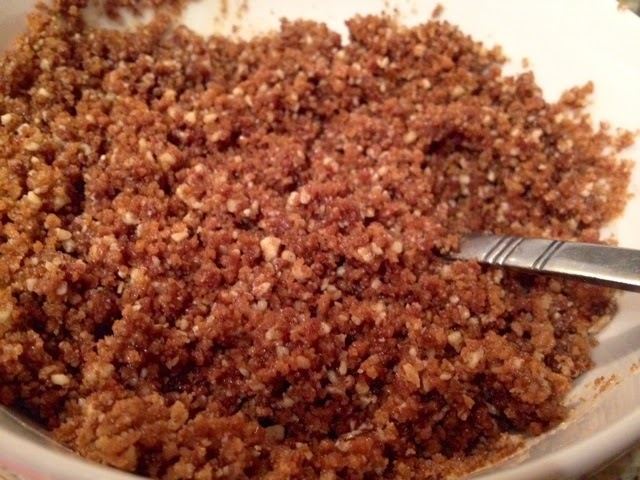 I then added powdered sugar and vanilla bean paste and continued to beat until stiff peaks formed. Transfer to a piping bag (ziploc bags work great too!) and store in the fridge until ready to use. 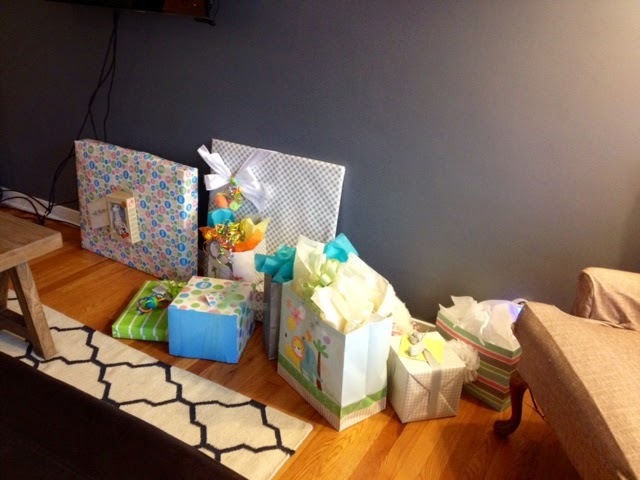 Yesterday my sisters, mom, and I threw my sister Meghan her baby shower! So crazy to think in just 2 short months I'll have another niece or nephew! 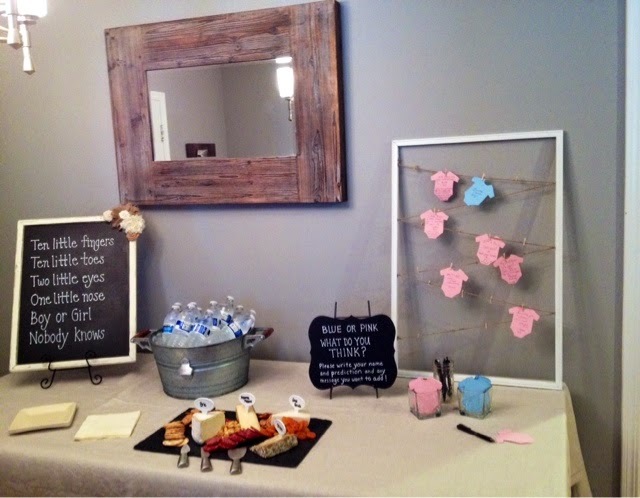 Thank goodness for Pinterest...it gave us all sorts of inspirations for the shower. It's truly the best tool, especially for throwing a party. 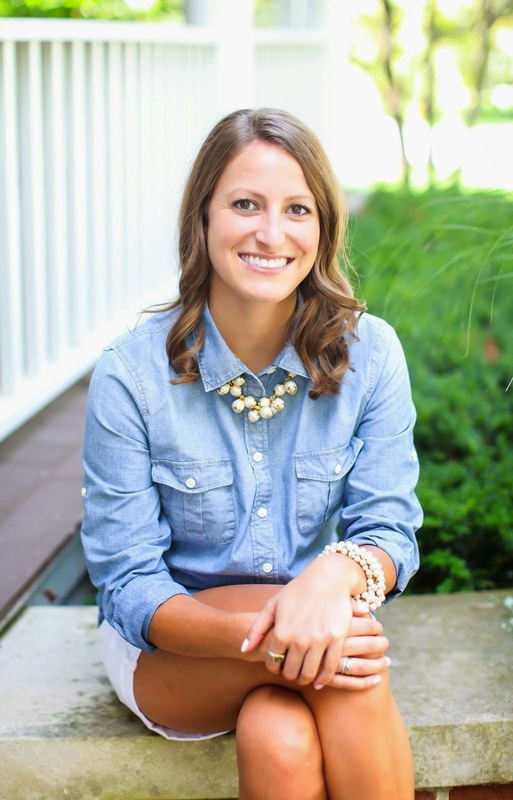 We all met a few times to game plan our themes and color scheme, menu, invitations, tasks, etc. and I have to say, it's been a nice excuse for us to meet regularly! Although we missed Meghan, she wasn't allowed to listen in on our planning. Sunday, although freezing and snowy, turned out to be a great day and everything turned out beautifully. Watching her open all of her gifts really made it seem real, that there is a baby arriving before we know it! 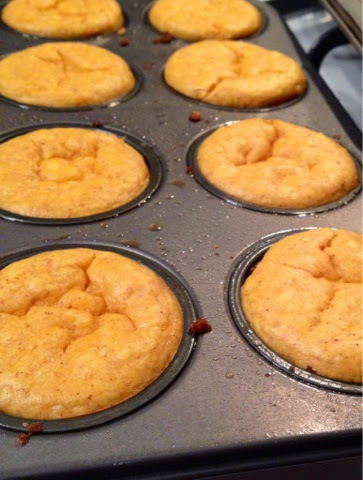 I wanted to share some photos of our decorations and I'll share my recipe for the pumpkin cheesecakes tomorrow! Stay tuned! Cheese platter and a fun gender prediction. 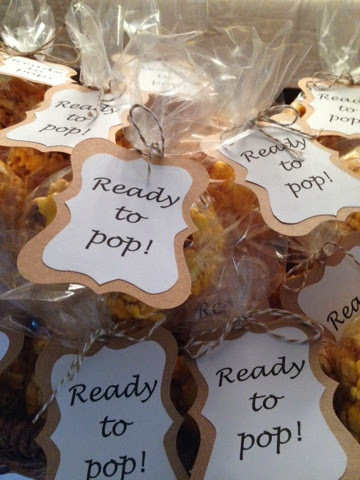 Cake pops, magic bars, pumpkin cheesecake bites, and banana pudding. 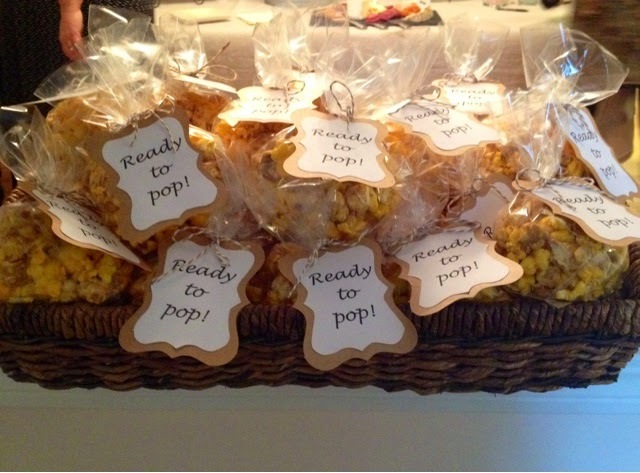 Cute caramel cheddar corn for party favors! 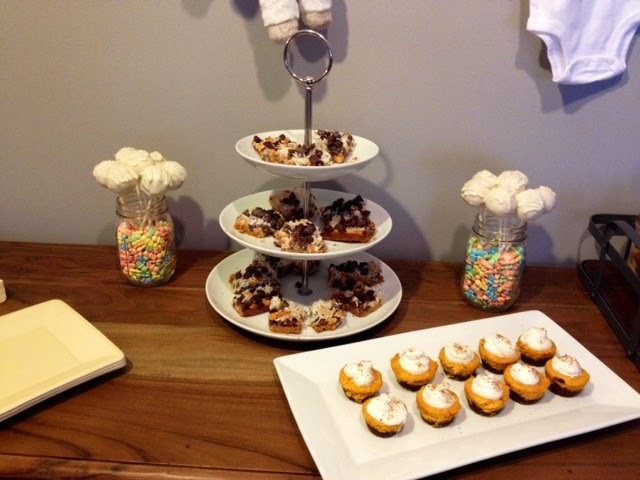 We kept the menu sweet and simple for an afternoon soiree. 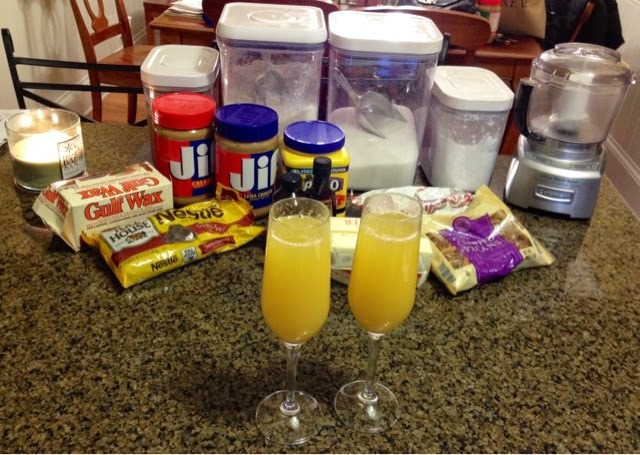 A nonalcoholic punch was served in a large beverage dispenser while wine and champagne were served in the kitchen. It's nice to serve in various rooms to keep from cluttering one area and also opens for fun conversations among guests. More pictures to come! !